The limitations of traditional databases have become a painful reality for government agencies and businesses as they strive to eliminate data silos and deliver real-time application performance. 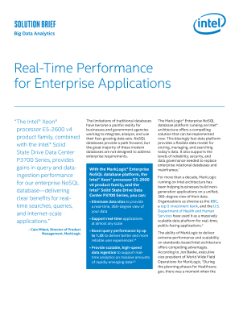 MarkLogic Enterprise NoSQL Database running on Intel architecture offers a solution. This blazingly fast data platform provides a flexible data model for storing, managing, and searching today's massive ...data sets, without sacrificing any of the resiliency and consistency features of last-generation relational databases. MarkLogic can be scaled out on Intel® Xeon® processor-based servers to provide a single, indexed data store for hundreds of terabytes of structured and unstructured data. The latest Intel® Xeon® processor E5 v4 family is ideal for these intense computing demands. MarkLogic is designed to load large volumes of data at high speed to support real-time applications using fresh data. The Intel® Solid-State Drive (Intel® SSD) Data Center Family for PCIe offers a valuable resource for accelerating data ingestion. Just as importantly, MarkLogic on Intel architecture can help organizations scale their data platform incrementally as demands grow, simply by adding additional servers and Intel SSDs. With this flexibility, government agencies and large businesses can continue to integrate new data sources, handle increasing workloads, and use all of their data to generate new business opportunities.